Looking for high capacity networks or fiber infrastructure by a specific area or region? FiberLocator has the information you need. Which carrier networks and on-net buildings are represented? FiberLocator is a rapidly growing, centralized database that catalogs hundreds of alternative access fiber providers. From household-name CLECs and carriers to lesser known municipal and utilities networks, FiberLocator has street level fiber infrastructure, including carrier maps and even dark fiber maps, on-net buildings, and data centers. Choose the data format that suits you best. Search anywhere in the US in seconds with FiberLocator Online, the easiest, smartest and most convenient fiber maps and data platform. Or, ask one of our map advisors to create a custom report of an area. For due diligence or more comprehensive research projects, rely on our team of experts to provide consulting, field level research and more. 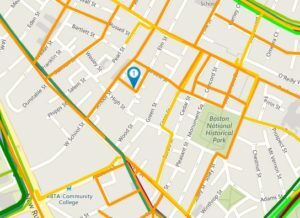 View map areas, on-net buildings and carriers with a demo of FiberLocator Online to see for yourself.